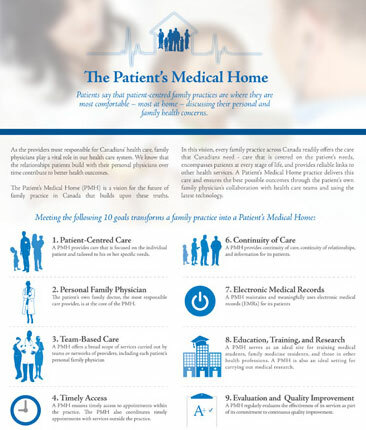 A one-page document succinctly highlighting the 10 goals of the Patient’s Medical Home. The Patient’s Medical Home One-Pager highlights and summarizes key points of the PMH Vision Paper. It briefly describes the PMH vision, as well as the 10 goals it aims to meet, from patient-centred care to internal and external supports. The One-Pager also acknowledges that similar models exist in several Canadian provinces, while emphasizing the benefits of the PMH model to different audiences. This document is a great way to introduce people to the concept of PMH without overwhelming them with information. Please contact us if you would like to receive hard copies of the PMH One-Pager for advocacy/promotion purposes.